Kenny Ponte is a good-natured, soft-spoken man who developed diabetes when he was two years old. Two years ago, his physician advised him to get on the organ donor list due to the likelihood of kidney failure. At the time Mr. Ponte was 36 years old and, barring his weakened kidneys, he was in good health and a viable candidate for organ transplantation. 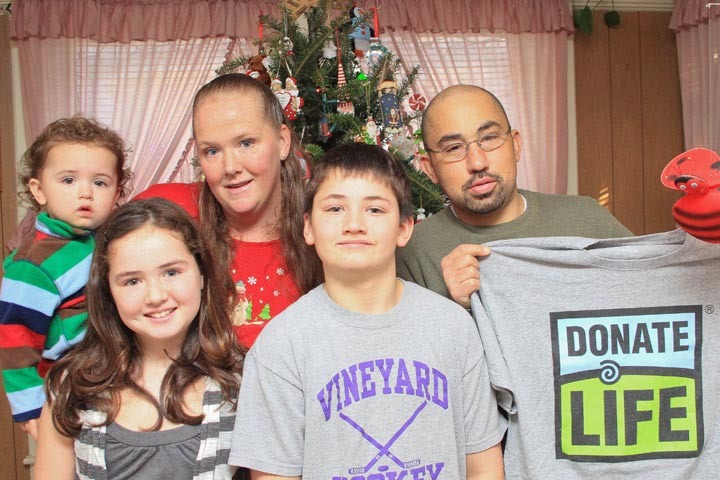 Last year at this time, as his health declined further and the prospect of kidney failure loomed, the Ponte family decided to go public with their struggle. The response from the community was immediate and significant, from material support to emotional encouragement. The Pontes have three children, Hunter (10), Shelby (9), and Jacob (2). Kenny’s condition continued to decline, though, and in early March he was rushed to Hyannis Hospital to have shunts implanted for dialysis. His weekly routine now would include four-hour dialysis sessions, three times a week. By mid-March, Kenny was back on the Island and the family was preparing to set up a home dialysis program. On March 25 the family celebrated Hunter’s tenth birthday. As his mother brought out the cake and set it before Hunter, he was told to make a wish. With the cake glowing in front of him, he made one silent request, that Daddy would get better. Then he blew out the candles. The next day Erica and Hunter were off-Island at a hockey tournament when her cell phone rang. She didn’t recognize the 617 number. Erica described the next 24 hours as “like being sucked into a tornado.” She returned to the Island, arranged child care with her in-laws, and rushed to Massachusetts General Hospital with Kenny and little Jacob. “Until they wheeled him in, I don’t think Kenny believed it was going to happen,” she said. The physicians informed the Pontes that in addition to a new kidney, Kenny would receive a pancreas. This would virtually eliminate his diabetes. The donor match was excellent too, improving the prospects of a successful transplantation. Kenny admits that the reality of living without diabetes is still sinking in. The other week he attended an off-Island game with Hunter’s hockey team and enjoyed several slices of pizza on the boat ride home. One of the statistics of diabetes is that it typically shortens one’s lifespan. When Erica married Kenny she accepted that his life would likely be cut short by the illness. Now, she’s opening her mind to the prospect of the two of them living a full life together. She’s also keenly aware of the importance of organ donation and the need for more people to register as donors. The Pontes are sensitive to the reality that their family’s gain is mirrored by another family’s loss. “How do you say thank you to someone who by one simple decision to donate an organ changed someone’s life forever?” she said. “Kenny appreciates his life every single day and the decision they made.” After Kenny’s recovery Erica sent a letter to the anonymous donor’s family through the New England Organ Bank, but has yet to receive a reply. As the holiday season approaches, the Pontes are entering a new and joyful chapter as a family.